Home /Copywriting » Copywriting and jargon: Don’t let yourself get overwhelmed! Copywriting and jargon: Don’t let yourself get overwhelmed! As a professional in the copywriting industry, it’s easy to get buried under piles of jargon when you’re tired or in a hurry to beat a deadline. Sometimes clients even demand the inclusion of jargon-heavy copy, which can really be a headache! There are several problems that can be caused by such a clash, so read over your copy with a careful eye for balance before you make it live. It implies that you don’t know your topic very well. Too much jargon makes one thing immediately apparent to the reader: you’re using a crutch. Even if you do know your topic, the reader won’t really pick up on that through the overload of industry catchphrases they’re trying to dig through. It’s bad for SEO. At first, this seems the wrong way around – surely people will be searching for these terms? The thing is, they aren’t. The concept of SEO is based around very human behaviour – the way people look for answers on the Internet. They are unlikely to type in a complex, confusing industry phrase and would be far more likely to instead go for the simplest keywords out there. You’re playing it safe. To be fair, many companies will prefer safe copy and there’s nothing wrong with that at all. But the last thing you want is to bog down a client in a flow of jargon when what they really want is to stir things up a bit. Jargon makes it look like you’re re-hashing old news. 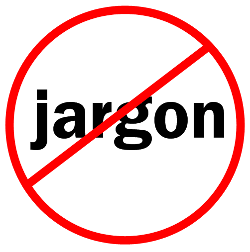 A lot of jargon is about conveying a term or idea in a far more complex (and often confusing) manner – basically, using ten words instead of two. It also makes copy look stale as most common jargon phrases are overused. Together, this gives the impression that you don’t have anything new or interesting to say, and that’s not going to help you keep your reader’s loyalty. There will always be days where you struggle to write for whatever reason, so be aware of the issues that can be caused by falling back on jargon to help you out. Keep in mind that balanced writing is best whoever your client is. For more advice on professional copywriting or if you’re looking for copywriting services, contact WSI today.